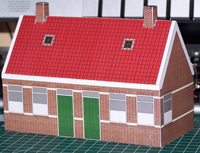 1/72 scale paper model of a Dutch village house. Cheap and simple houses for workers, often seen in rows of identical houses in villages or in towns. Built around the turn of the century.